City Colleges of Chicago affords students from all corners of the city access to a quality education and ensures their success by providing the support to complete their program and move on to further education or a career. Since 1972, the PBC has enjoyed a long-standing partnership with the City Colleges of Chicago and have built and / or completed major rehabilitation of several facilities including, but not limited, to the Central Administration Building, Daley College, Olive-Harvey College, Malcolm X, College, Truman College, Kennedy-King College, Lakeview Learning Center, Dawson Technical Institute, West Side Learning Center and Harold Washington College. Today, the PBC still works closely with the City Colleges to maintain and improve its facilities by providing periodic upgrades and construction services. 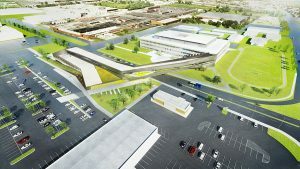 City Colleges will work with the PBC to oversee the construction and modernization plans for the $75 million Advanced Manufacturing Center at Richard J Daley College. The state of the art manufacturing center is slated to unlock thousands of opportunities for students to seize jobs and meet the growing demand in the advanced manufacturing industry. The PBC is proud of the new, modern buildings or beautiful renovation projects we have delivered on behalf of the City Colleges of Chicago. The range of capabilities involved in the successful Public Building Commission – City Colleges’ partnership combined with the direct economic impact they have had on our communities, underscore the true role of public development in making our city a better place to live, work and raise a family.